The husband of Luxembourg’s gay Prime Minister Xavier Bettel, Gauthier Destenay, has been mixing and mingling with the wives and girlfriends of other world leaders during the NATO conference. How awesome is that? And how handsome is Destenay? And why is Melania smiling? These are questions we need answers for. 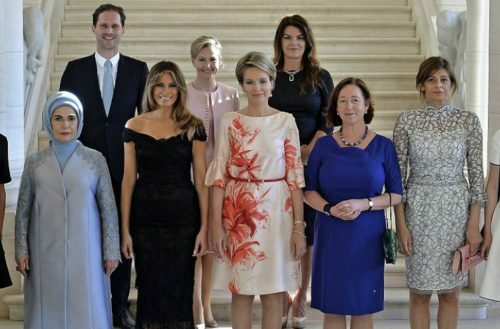 A Belgian architect, Destenay joined US First Lady Melania Trump and others in Brussels on Thursday while their partners were off discussing world matters. 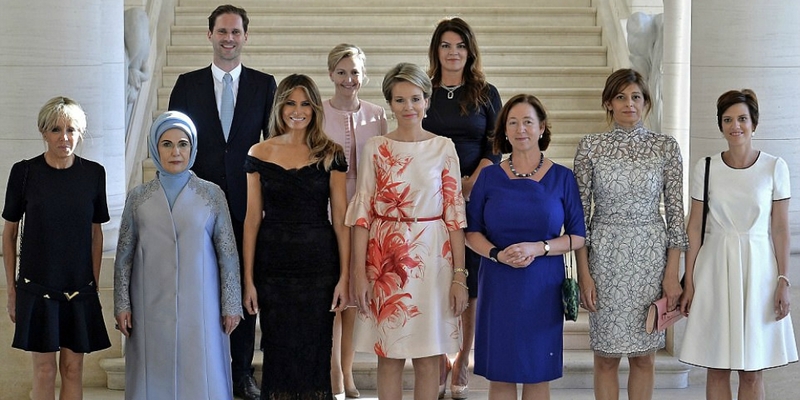 The First Gentleman posed for photos with the group of women at Royal Castle of Laeken on ahead of a dinner especially for spouses. We like to think the matters these women and Destenay discussed over cheesecake involve Melania’s escape plan from Trump Tower. Look at that smile on her face! We haven’t see her this happy since before the election. Somebody notably not happy is Emine Gulbaran Erdogan, the devoutly religious wife of Tayyip Erdogan, President of Turkey. We’re not exactly sure why the First Lady of Turkey seems not too be pleased. Maybe it’s because Destenay was included in the photo op. Or maybe it’s because the kitchen messed up her order and gave her the chicken instead of the salmon. We hate when that happens, too! Just give us the vegetarian option instead. This is groundbreaking. We love seeing Gauthier Destenay so unapologetic about who he is – standing strong and firm in front of all the world to see.